As one kind of Piatnik brand poker cards, Piatnik Economy plastic-smooth blue cards are made in Austria, each deck of Piatnik Economy plastic-smooth blue cards contains 55 bridge size cards, each deck is packed with paper box. With its blue color and 4 corner regular index, we always mark this kind of playing cards with small font in four corners, the color of the ink is white. 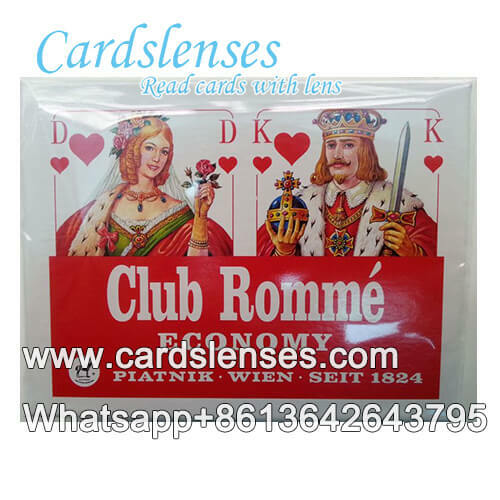 This kind of marked cards is always a cheating tool in games and magic performance, when you want to play poker tricks to fool others, or want to give a wonderful magic show, you can choose Piatnik Economy Plastic smooth blue cards to help. Please buy a pair of infrared contact lenses as well, they will help you to see the invisible marks on the cards.